A special gift for the culinary connoisseur….but you’d better double-wrap this one so the smell doesn’t give it away. I’m a truffle addict and have wasted more $$$ than I like to think about on secondary truffle products. JRMushrooms rules when it comes to this odoriferous little gem. The gift comes with a complete description of each product along with serving suggestions. Large Black Truffle Oil – 8.45 oz. Large White Truffle Oil – 8.45 oz. Black Truffle Tapenade – 6.3 oz. White Truffle Paste – 3.15 oz. White Truffle Honey – 4.5 oz. White Truffle Cream Sauce – 3.15 oz. 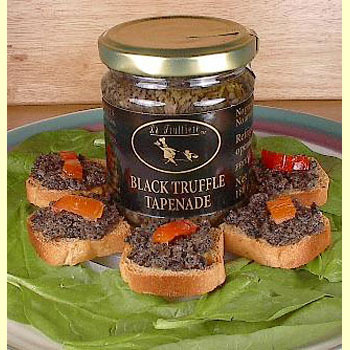 Mixed Truffle Carpaccio (Black and White Truffles) – 6 oz. P.s. If your sig. other doesn’t like truffles-gasp- JRMushrooms & Specialties, also offer many other outstanding quality gourmet products such as dried mushrooms, porcini mushroom powder, lavender from Provence, peppercorn mixes, saffron, truffle oils, truffles, estate-bottled extra virgin olive oils, flavored and infused oils, walnut, pistachio and pumpkinseed nut oils, lavender, sea salt (Fleur de Sel), vanilla, vanilla beans, orange flower water, rose flower water, sun dried tomatoes, and other gourmet specialties.